This is the 18th installment in my blog series on Christian Baseball Players. 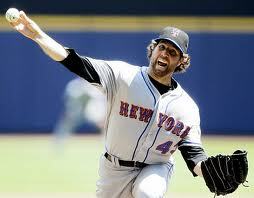 Today, we head to the Big Apple to learn more about a key member of the New York Mets starting rotation – R. A. Dickey. His story, like most, has known its share of hardships. 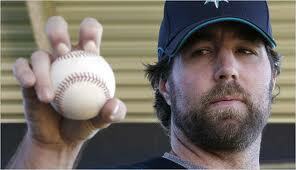 Dickey was born without an Ulnar Collateral Ligament (UCL) in his throwing arm. As you can read in this article, that is a very significant problem – the UCL is important in many regular daily activities (like turning a doorknob). So the promise of his career (he was drafted 18th overall) was reduced to an expectation that baseball would not be part of his life. He tried to continue pitching conventionally, as he had for his career up to this point, and although he made it to the majors, he had some struggles. An injury took away much of the velocity he was used to. He had to vastly change his game in order to have a shot at a prolonged big league career. In 2005, Dickey met up with Orel Hershiser – who was a successful pitcher in his career and was at that time working as a pitching coach in the Texas Rangers organization. Hershiser suggested that Dickey try and develop a knuckleball, a pitch that wouldn’t stress the arm very much. Dickey was struggling to make it in the majors. You can see his career stats here. Only last year – at the age of 35, did he have a “break out” year. He was the most reliable starter on the Mets team and earned a new contract that will pay him fairly well over the next couple of years. But Dickey knows that it isn’t about the money. Back when he and his family were working through the minor league life he along with friend and fellow baseball player Jonathan Johnson started an organization that has as a mission to share baseball, medicine and Jesus Christ with Latin America. The organization is called Honoring the Father Ministries (HTF). HTF organizes baseball tournaments, clinics and camps all around Latin America. This includes permission to travel and organize events in Cuba, a country that is generally closed to Americans, not to mention evangelical missionaries. Dickey regularly goes on these trips. What an image to picture: a major league baseball player sleeping on a dirt floor. By Dickey’s own admission, the very fact that he is in the able to pitch at a big league level is a miracle. God has allowed Dickey’s story to be known so that Dickey can declare the miracle that his career has been. Now that he has achieved a measure of success and a contract that reflects it, he is using those riches to boast about the Lord and the opportunity to know Him. And his desire to impact others continues. This coming off season, he and 3 others that he knows through baseball are planning an excursion. The goal? To climb Mt. 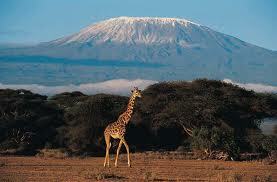 Kilimanjaro in East Africa. Dickey, Kevin Slowey (Minnesota Twins), Dave Racaniello (Mets bullpen catcher) and Mets physical therapist John Zajac will set out to trek to the top of the 19,340 ft. mountain in January. The goal of the climb is to raise money for the human trafficking organization Red Light District Outreach Mumbai. I think this is an amazing story because it is a miracle that he is able to pitch at all. God is doing great things through him and I am excited to hear him continue to boast, not in his riches or accomplishments, but in knowing Christ and telling others about Him.